MANILA, Philippines – After his triumph over Mexican champion Fernando Montiel, newly crowned bantamweight king Nonito Donaire Jr. immediately got himself a delicious treat: a gallon of ice cream. Donaire said the ice cream served as a self-reward for all the sacrifices and dieting he had to undergo while preparing for the Montiel fight. 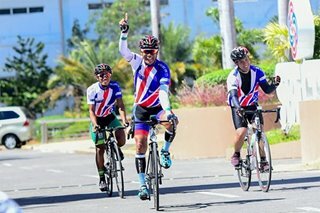 “Wala na ‘yung mabigat sa shoulder ko [tulad ng] laban, ‘yung pressure at saka anticipation,” he told Bev Llorente of ABS-CBN North America Bureau. The Filipino Flash limited his food intake in the remaining days prior the fight just to make the 118-pound bantamweight limit. His hard work paid off as he scored a quick 2nd-round technical knockout over the more experienced Montiel to walk away with the World Boxing Council (WBC) and World Boxing Organization (WBO) bantamweight titles. Donaire received a $350,000 fight purse of P15.4 million for the Montiel fight. "It was $350,000 but mostly half of that sa tax, sa managers, sa coaches. So kaunti lang ‘yun,” he said. Despite the overhead expenses, Donaire said he is still thankful for the exposure the fight has given him. “It’s just a blessing na nakita ako ng mga tao. So, maybe in the future p’wede na kaming mag demand [ng bigger purse]," he said. Donaire also said that he and his wife will save the money for the rainy days because he can’t remain boxer all his life. He said that he went through hardship as a young boy. Back then, he sold ice candy for extra money and could only afford to drink soda during special occasions. “Batang bata pa ko noon. ‘Yun lang talaga ang naging mundo ko... it was hard. Siguro that's why alam ko na i-cherish ‘yung being blessed,” said Donaire. The Filipino Flash is just one of the few boxers who became financially successful in boxing. Some of the known rags-to-riches boxing stories are those of Filipino superstar Manny Pacquiao, Mexican champion Juan Manuel Marquez and legendary boxer-turned promoter Oscar de la Hoya. Donaire admitted that he still has a long way to go before becoming a real boxing superstar.